Emoji have been on the rise recently in various forms of communication. From peppering your tweets with relevant emoji to texting a friend an emoji that says more than words ever could, they’ve become rampant and don’t seem to be slowing down. 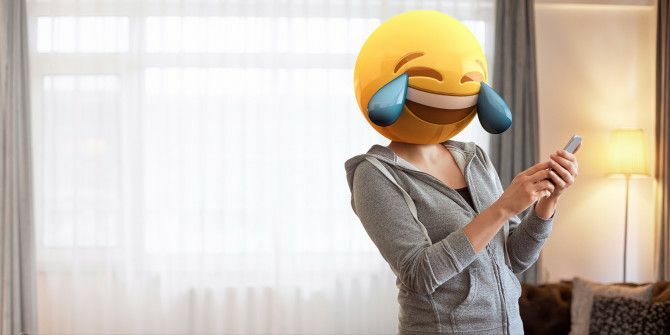 Sometimes, though, you just don’t know which emoji is right for the situation, especially if you’re still not sure what every emoji means What Does This Emoji Mean? Emoji Face Meanings Explained What Does This Emoji Mean? Emoji Face Meanings Explained Confused by the emojis in that text message you just got? Here are the commonly accepted meanings of popular emojis. Read More . For those times, a new tool that you can run from the command line, called Emoj, is there to give you some emoji assistance in a fun, geeky way. It works best on macOS, but runs on Linux too. I can type a reply within 10 secs but take 20 secs to select a perfect emoji??? The tool can be found on the developer’s GitHub page, but you’ll actually get started by installling Node.js from its official page. Now, you can simply type “emoj [text]” to search for an emoji that matches what you’ve typed. While goofy, it’s a quick way to find emoji that match what you’re thinking. And you don’t have to be scared of the command line A Beginner's Guide To The Windows Command Line A Beginner's Guide To The Windows Command Line The command line lets you communicate directly with your computer and instruct it to perform various tasks. Read More — this is easy! Please understand tht I'm struggling to find the perfect emoji. Unfortunately, this tool doesn’t really work on Windows (as discussed by many users in an issue thread), but we’ve shown you how to access emoji in Windows 10 How to Find Emojis in Windows 10 How to Find Emojis in Windows 10 The language of the emoji unites us all. Smiley faces have been popular since the 90s, but their breakthrough came with smartphones. Now Windows 10 added more colorful emojis and here's how you find them. Read More , so all is not lost! In addition, because Linux displays emoji in black and white, the developer of Emoj recommends you check out Emoji One if you’re rocking a Linux install. Have you found any useful emoji from this Terminal app? Let us know your favorites in the comments! Explore more about: Emojis, Terminal. It's unfortunate that this app does not transfer files to your devices SD card! It is a fantastic app but, without that feature it is useless to me. "Unfortunately, this tool doesn’t really work on Windows"